Last lovely weather day before the start of more rain the following day. A great group which included this year's new scramble students and a few seasoned ones. Thought there was going to be a lot more snow, but as Snoqualmie Mtn came into view on our drive to the Alpental parking area, I knew this was going to be an easier scramble than anticipated. Left the parking lot at 8am. Much of the rocky stream bed trail was wet from running water, but thankfully it didn't make the rocks slick. We encountered snow just before the junction to the Guye Peak turnoff. Nothing serious enough to put on traction, but needed some careful stepping to avoid postholing. From there we followed bare trail and previous tracks in the snow all the way to the summit. Crossing the stream with the beautiful, hard running waterfall was no problem. The consolidated snow under the trees was a bit icy, but with careful foot placement and ice ax use, everyone made it with no problems. Once we were out of the trees and on the ridge to the summit, it was easy to kick steps when there was snow. Still some cornices near the summit, so stayed closer to the trees. Bruce, a long time naturalist filled us in on the names of the many plants starting to appear. 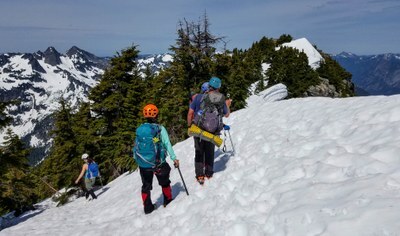 We had a few breaks, one at the waterfall to enjoy its beauty, one before starting up the ridge and one on the ridge in order to admired Guye Peak, Keechelus Lake and Mt Rainier. Spent half hour on the summit naming peaks and chatting with 2 old timers, one who took the Mountaineers climbing course 40 years ago. The weather was perfect, sunny, a few clouds and breeze. A lovely, leisurely day in good company. Back at our cars around 3:15pm.